CONTACT - BRIAN HOUSAND, PH.D.
​2019 is on track to be my busiest year yet! Last year I traveled to 15 different states and my latest book ​Fighting Fake News! Teaching Critical Thinking and Media Literacy in a Digital Age, was published. 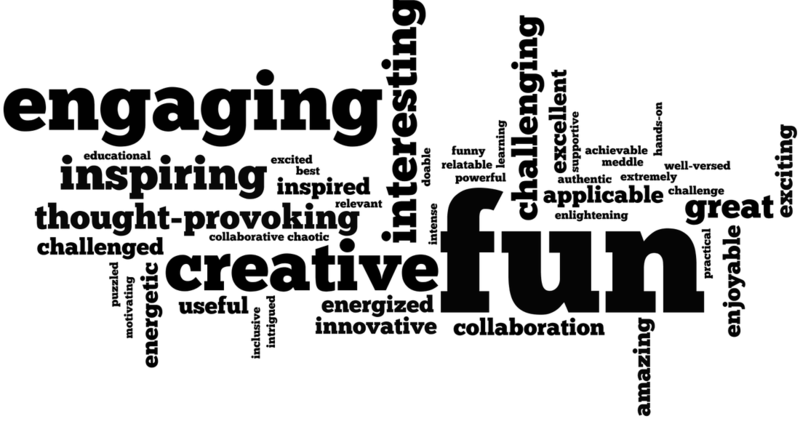 Participants were asked for three words that best expressed their feelings about my session. Below is a word cloud with the top 100 words. Such enthusiasm! Great ideas! Thank you for providing a brain break from the rest of the conference by integrating joy into the learning process! I can't wait to get back to my classroom and "meddle". I really appreciate all the useful info and lesson ideas. They will be very helpful to get things jump started. This has been, by far, my favorite session the last two years at Edufest. I've been challenged, in the most fun way, and I'm super excited to take all of the ideas, shared and inspired by this session immediately into my classroom. THANK YOU! GREAT! Brian models and connects important topics. Very inspiring. I ALWAYS love your sessions. You are so organized, creative, & truly inspirational. Thank you! Not only fun, but VERY useful session! My future students thank you, and I THANK YOU! I have so many ideas about how I can use the information from this class with my students! Thank you for the great ideas! Love your energy! I think I will literally use ALL of this! Great session! THANK YOU! Always always great! Loved it! This was by far my favorite and most interesting class all week. Thank you for bringing a more hands-on and less solely cerebral experience.